Granite City Food & Brewery not only provides an unmatched signature brew experience, but you can also get the best gourmet burgers in Naperville. The incredibly tasty burgers at Granite City Food & Brewery come on a fresh gluten-free bun and are served with your choice of crispy-fresh kettle chips, natural-cut fries, or coleslaw. Customize the best gourmet burgers in Naperville with a wide variety of fresh ingredients. Call Granite City Food & Brewery at 630-544-3700 for reservations and complete information on the best gourmet burgers in Naperville. You can also simply fill out the contact form on this page and a helpful representative will respond to your inquiry shortly. Gourmet steakburgers cooked perfectly to your preference is a featured item on the diverse menu at Granite City Food & Brewery. Choose from a wide range of delicious burger variations, where you are sure to find the perfect gourmet burger to suit your tastes. If you and your family are burger lovers (and let’s be honest, whose family is not! ), you want the best, and at Granite City Food & Brewery, you will positively get the best gourmet burgers in Naperville. When it comes to quality of ingredients and care of preparation, Granite City doesn’t cut corners. Your custom burger is made fresh to order every time. 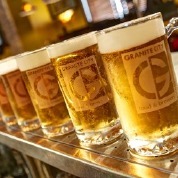 Granite City has the finest selection of signature brews and the best gourmet burgers in Naperville, call 630-544-3700 today to speak with a knowledgeable and friendly representative. Or you can simply fill out the contact form on this page and we will promptly respond to your inquiry.